As I draft out this blog entry I am listening to Thomas Tallis on my headphones. Most of the craftspeople in the workshop in the back of our warehouse wear earbuds under their ear protection. The showroom and receiving and shipping areas usually have music playing. The music is the source of ongoing debate - typically with me on one side and everyone else on the other side. The music is a very eclectic mix favoring Jeff Beck and Afro-Cuban jazz, among other selections, carefully chosen by Jocko, who is a professional musician http://bluesavages.com/. Jocko believes that the showroom needs music to enhance the atmosphere, for both him and everyone else. He says headphones get in the way of responding to the phone and other people. Meanwhile my own sense of being considerate means I use headphones a lot - other members of my household do not want me to share my music. (Sally is working with headphones now listening to Tool and Greta Van Fleet.) 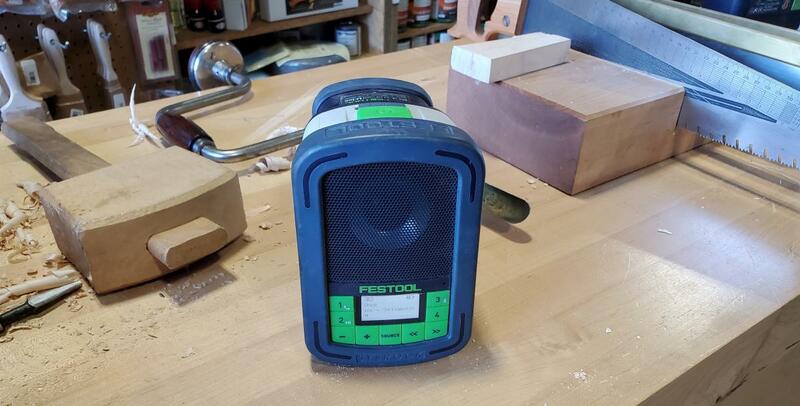 The question of should one listen to music while working in the shop is complicated and there are many things to consider. The first and by far the most important consideration is: Is it safe? Other questions are: Are you more or less productive? Are you more or less creative? Headphones or Speakers? Does the kind of music matter? What about the spoken word? Alone or when there are many people in the shop with you? I would like to point out that the text below is my opinion reinforced by testing. But my testing sample is me, so your mileage may vary. Whatever you get out of this blog, I strongly suggest that you test out any theory. More productive with music? than test your productivity without it. Does the type of music matter. etc. I seem to do four types of tasks in the shop. 1 - Mindless repetitive work by hand. Sanding comes to mind right away, but there are a lot of other activities that probably also meet this definition. Milling wood by hand, for example. I find music helps with the cadence of this kind of handwork -- and when it comes to sanding or finishing it makes the job less boring. I never work with headphones on in a workshop because I really feel I need to hear the machines and pay attention to interruptions. Until recently I did not own any wireless headphones (which I do not like), so I was always worried that I would get tangled in the cord and ruin either myself or the headphones. So given my druthers, if I am working alone I will want some music going. It also makes me more relaxed. When I am doing mindless work I can listen to anything I like. If I am working with other people, if I like the music being played that's great. Otherwise I find it incredibly annoying. 2 - Mindless repetitive work by machine. In general I worry about safety. I suppose with a sander it's not a problem, but when you are using a saw - let’s say to cut 20 identical pieces against a stop - I would not want to take a chance at losing focus. This especially applies to headphones (if the music is played on speakers at a truly background level I can mostly tune it out). It’s important to hear machines. Some machines are deceptively safe. I sometimes have had to do a huge amount of grinding. I do it in silence. I would probably be fine with some music but I don't want to take the chance. 4 - Work (hand and machine) that requires paying attention. I put thinking and paying attention in the same boat. A bunch of years ago I read a study where a bunch of programmers were given a technical problem to solve. The control group worked in silence. The other group listened to music of their own choosing. At the end of the study it was determined by whoever analyzed the results that the group working in silence had better solutions and showed more creativity. When I read these results, I decided to try the experiment for myself, and my own results concurred. Therefore if I do any work that requires even a modicum of thinking or paying attention, I work in silence. In a shop I am very likely to wear ear protection, not because of the level of noise, but to help me concentrate. I get arguments about this all the time from my co-workers. They say they don't have this result. Back to my first point: try it out for yourself and see. When it comes to safety, I think it is obvious not to have any distractions. After that individual preferences can dramatically vary. PS: Sound reproduction is also a highly personal choice. The links to the headphones and speakers are because I like and own them. I've been using Grado SR80s for years and they are made in Brooklyn. I have been using the same pair of Epos 11 speakers (no longer made) in my house since c. 1987. Just out of curiousity, could you share the list of stuff that Jocko picked out for you to listen to? I don’t know if I’ve ever heard any Afro-Cuban jazz, and I’m always open to new stuff. Great post! Actually Joel--I was wondering what you listen to and if it varies depending on the type of work. Also in my shop I often listen to my local NPR affiliate primarily for news and news programming. Does that fit into your sonic space as well? Dean, to be quite honest I've never picked out music specifically for Joel. Joel's desk is close to mine, the best I can do is play music that doesn't offend him too much. If there is music playing that you don't like it's not music any more it's noise. I love Cuban big band Jazz from the 1950's I might spin Alfredo Valdes, Noro Morales, Cachao or Machito. Also from the 1950's Los Zafiros, a Cuban doo wop vocal group. When I need some energy I might play some recent Jeff Beck, King Crimson or other high testosterone rock music. I find that instrumental music does not interfere with sales/conversations as much as music with lyrics. A quick peek at my YouTube history shows the Rolling Stones, the Temptations, Albert Collins, Erik Satie, the Police, Devo, ZZ Top, James Brown, David Lee Roth and Van Halen, Colen Linden, Shakti with John McLaughlin, John Coltrane, the Supremes, Miles Davis, Joe Satriani, the Meters, Cream, Jack Bruce and of course Jimmy Durante etc. etc. I dig the blues but try not to play too much of it in the shop. I have a record and CD collection of several thousand items. I also use Pandora. But as everyone at work will tell you, When I do any work that requires any focus at all I work in silence and EVERYONE's music break my concentration and I cannot get anything done. At work I routinely wear ear protection which unfortunately doesn't block most music. If on the other hand I am working at home doing something mindless like paying bills I listed to 80's punk or celtic music. When I am doing something that isn't that hard and I am the right mood Early Music and Gregorian Chant fits the bill. Jocko's music tastes are pretty eclectic and I mostly like what he's playing. But that's part of the problem. If I like it it is distracting. If I don't it is invasive and annoying. On questions like this, I'm always reminded of Joshua Klein's blog post from some years back, "Bellowing at the Rate of 19 Strokes per Inch." Anything sharper than sandpaper, no music. Sanding and other boring “DULL) jobs get some jazz. I work in silence almost full time for safety’s sake. I turn on music when I’m sorting parts, wood, and cleaning up. Only then. Safety is too important to me. We, as humans, cannot safely multi-task, in my humble observations of myself, in a potentially dangerous shop. Great topic for discussion! Thank you! As I get older I find silence (other than whatever noise I am making) works best for me. Sometimes I have, at a background volume, the local classical music station on or jazz, so long as it isn't vocal or otherwise demanding attention. Never spoken word. For that matter, I no longer have the radio on in the car. As for repetitive work (many cuts against a stop, etc. ), one of two serious shop injuries came from just that 40 years ago on a pre-blade guard radial arm saw. I should have had my after-lunch nap instead of heading right back to the shop to "get it done!". I don’t listen to music when using machines. Sensory over load. Sometimes I do when finishing, but that depends. If I am doing a simple finish (like a wipe on varnish, oil, wax or shellac) then I play music, usually jazz (Coltrane, Miles Davis, etc). But if I am spraying a high performance finish like 2k poly or conversion varnish I prefer silence as they require focus and it helps to hear what I am doing. For shop clean up, restacking lumber, or general putzing around I will play anything from Bobby Darin to Anthrax. I tend to use over the ear muffs with built in sound attenuation usually either howard-leight synch (with BT adapter) or Edifier W830BT. sometimes if it's going to be mostly handwork I'll use shop speakers. What I have found is that I tend to do cleanup/grunt moving work with spoken word podcasts typically. Nearly all other shop time uses a variety of upbeat instrumental music or songs with lyrics in a language I don't understand, otherwise it distracts from my mental capacity, but with it, I find it amps me up and sets a cadence to activities. I don't tend to have it loud enough to overwrite shop sounds. I'm often surprised though by the time I spend doing quiet handwork without music and yet with earmuffs on in dead silence and only realize after some time how deep I've been in the moment and without a single sound.